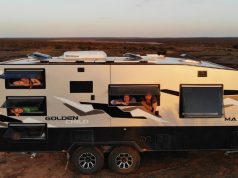 You want a travelling lifestyle? Then you need to jump on the RV band wagon! 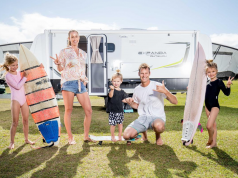 A Jayco Swan Camper Trailer is a fantastic choice as the set-up & pack-up is super easy. 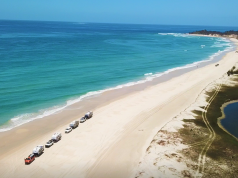 Whether you’re looking for a relaxing getaway along the coast or deep into the centre of the country, the ever-popular Camper Trailer comes with a choice of seven floor plans and choose from either a standard touring or an Outback model for heading off-road. The Swan model is a popular choice and comes with two double beds – a kitchen, roomy living space, and plenty of windows to let in the natural light and the views. 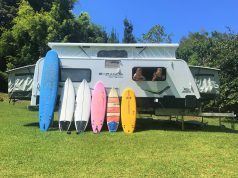 Check out all the specs and the full range online, or head to a local Brisbane Camperland showroom. Reflections Holiday Parks Clarkes Beach is a great place to park your camper. 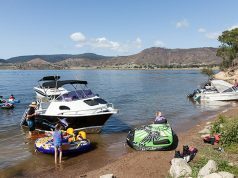 It’s got great beach access, and is within walking distance to town. The Farm in Byron is also worth checking out. It’s a collective – a restaurant serving up homegrown produce, a bakery, a nursery, and a working farm. Farm tours are very popular and are offered daily for just $5 per person. They also offer kids art workshops during school holidays.